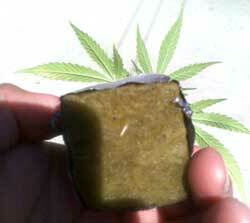 Cannabis likes a comfortable room temperature when growing indoors, or a little warmer – not too dry, not too humid. For a lot of indoor growers, that is all you need to worry about. 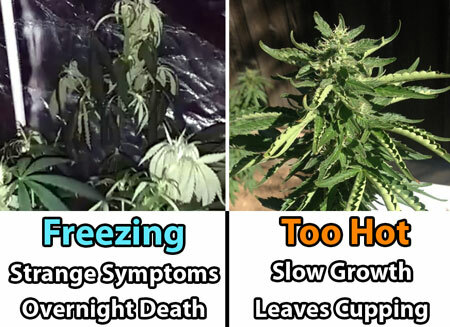 If it feels too hot or too cold for you in your grow area, it’s probably too hot or too cold for your cannabis plants as well. Cannabis plants like about the same temperature as humans do! If your grow room feels warm or cold, humid or dry, that is a sign that you may want to look into changing the temperature and/or humidity of your grow area. Generally, cannabis plants prefer temperatures in the 70-85 °F (20-30 °C) range during the day when lights are on. When lights are off (or at night), cannabis plants are happy with slightly cooler temps. 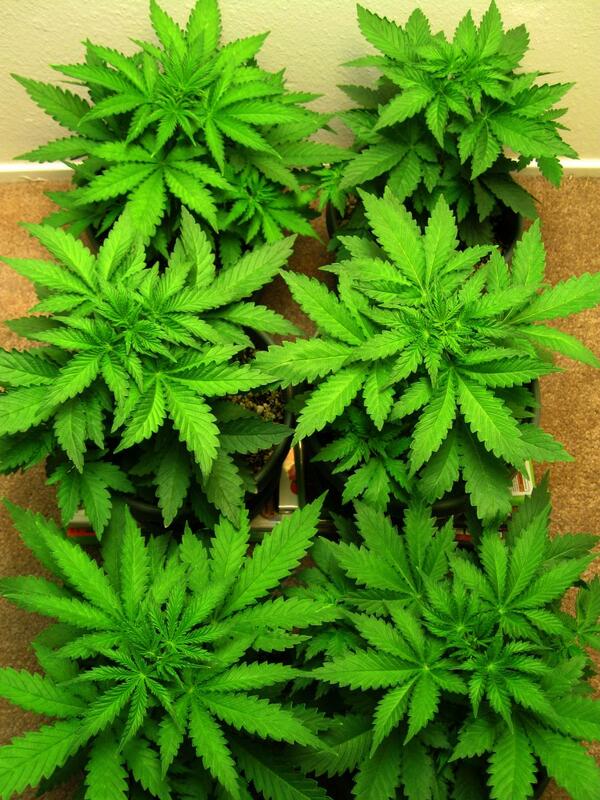 Vegetative Stage: Young growing cannabis plants in the vegetative stage prefer temps a bit warmer than in the flowering stage, in the 70-85°F (20-30°C) range. More about temps in the vegetative stage. Flowering Stage: In the flowering stage (when cannabis plants start making buds), it's best to keep temps slightly cooler, around 65-80°F (18-26°C) to produce the best color, trichome production and smell. 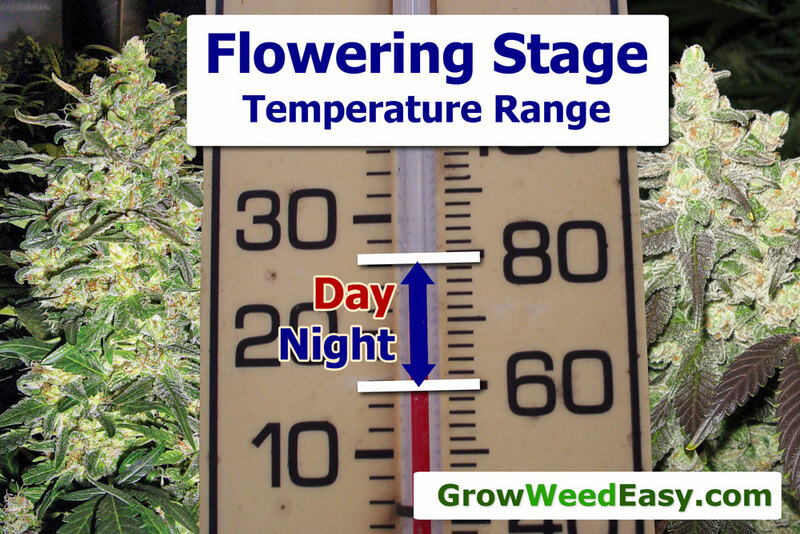 There should be a 10 degree difference between night and day temps for the best results (this is especially important in the flowering stage for highest quality bud development). More about temps in the flowering stage. 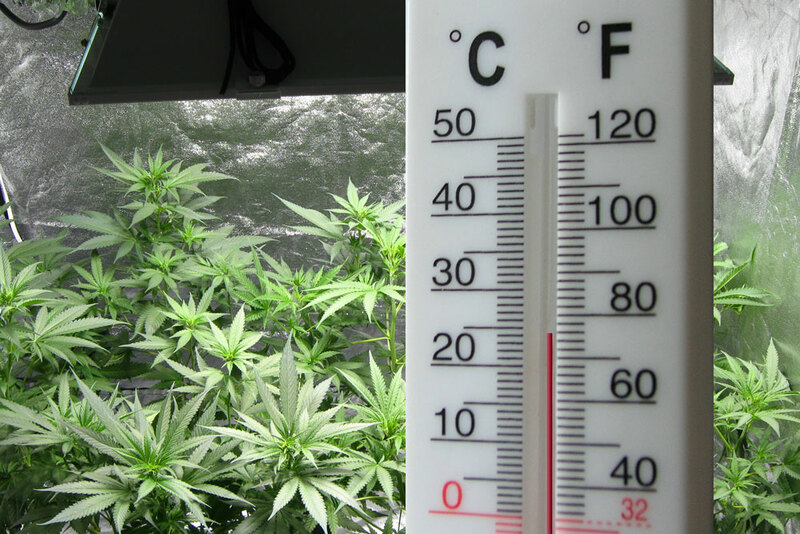 Why Is Temperature Important When Growing Cannabis? Can cannabis stand freezing temps? What happens if your grow room gets too hot? Different afflictions can happen from high or low temps, so let me break that down for you. Colder temps will tend to slow down growth. 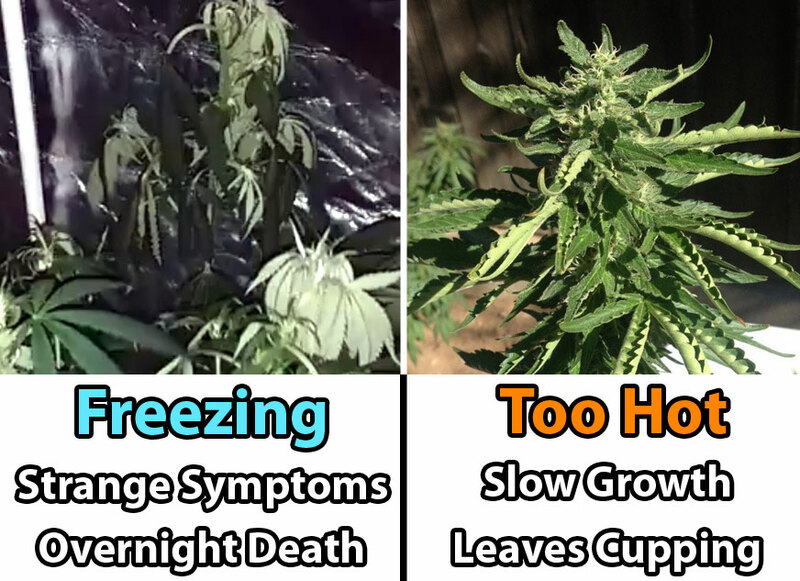 Temps lower than 60°F (15°C) tend to upset plant growth and freezing temperatures will shock or even kill a cannabis plant. Plants are more susceptible to certain types of mold when it's cool, especially if it's also damp. Colder temps and big temperature fluctuations contribute to over-purpling of leaves and can also reduce photosynthesis. A plant that is grown in relatively cold temps can survive, but it will never grow as fast or as well as a plant that is given proper temps. Indoor plants tend to be much more susceptible to cold than outdoor grown plants. While cannabis plants don't usually die from the heat, too hot temps will cause plants to grow much more slowly. Please note temps above 80°F (26°C) in the flowering stage will not only slow down bud growth, but can reduce the potency and smell of your buds – keeping the grow room temperature under control is especially important in the flowering/budding stage! In the heat, cannabis is also more susceptible to many problems, including spider mites, white powdery mildew (especially if it gets humid, too), root rot, nutrient burn (from increased water transpiration), increased stretching, wilting due to root oxygen deprivation, and reduced “smelliness” of buds (as terpenes can burn away at higher temps). With bright grow lights (such as 600W HPS and brighter), cannabis plants of all stages can thrive at slightly higher temps up to a max of about 85°F (30°C) even with no CO2 enrichment, as long as there is low relative humidity and plenty of air movement. Cannabis plants like higher temps when you supplement the grow room with CO2, but there are a few important things you must know about CO2. Keep temperatures between 85°F (30°C) and 95°F (35°C). What else is affected by the temperature in the grow room? Temperature fluctuations can actually change how your plant grows! Cannabis generally prefers a cooler temperature at night, and slightly cooler temps during the dark period will encourage your plant to grow as fast as possible. Slightly warmer night temperatures will tend to slow down upward growth. Temperature has a big effect on the relative humidity of your grow area. Temperature during the flowering/budding stage can change the taste & smell of your buds. Tip: Use Temperature to Help Control Growth! Cannabis generally prefers slightly cooler temperature at night and warmer night temperatures will tend to slow down upward growth. But… you can occasionally use this knowledge to your advantage to help control plant growth! By artificially raising temperatures during the dark period, it will slow stretching plants that are growing too tall too quickly. This can be a helpful way to reduce the "stretch" if you're growing in a situation where you don't have a lot of vertical room. And never forget about supercropping, the ultimate way to break down the height of your plant at any time. By keeping temps a bit cooler during the dark period, you will actually encourage your plants to grow as fast as possible. In this section you will learn a little bit more about how the temperature in your grow room affects the humidity. 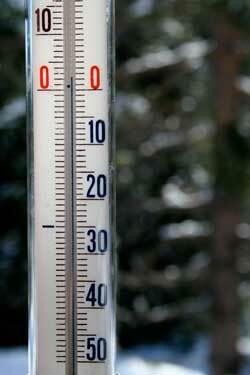 Temperature and relative humidity (RH) are closely related to each other and each has an important affect the other. Sometimes you can overcome a problem with one by fixing the other. "Humidity" measures how much water is currently “being held” in the air. "Relative humidity" compares that amount to the maximum amount of water that can be held at that temperature. Plants can thrive at different relative humidities depending on the temperature of the air. Once the air becomes too saturated with water, it will tend to form dew or films of water over leaves, which leads to mold. 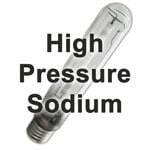 For those interested in learning more about the science behind this, there is a term used by greenhouse growers known as VPD, or "Vapour Pressure Deficit," which roughly measures the temperature and relative humidity. When growing cannabis plants, relative humidity(RH) is just as important as the temperature of the air, and is something you should pay attention to, especially if you notice that your grow room is particular dry or humid. 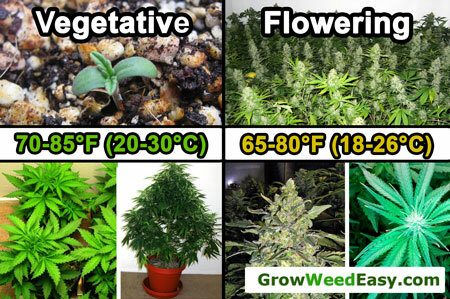 You need to control both temperature and RH at the same time to get the best results when growing cannabis. If the air is too hot and dry (high VPD), plants will tend to have slow, stretched growth. If the air is too cool and humid (low VPD), plants grow slowly and are prone to problems with mold or fungus. Clones do not have a root system yet, and so they need to get all their water via transpiration of the leaves until their roots are fully formed. Therefore, clones prefer humid conditions with plenty of water evaporated in the air. That's why many people use a humidity dome or "cloner" to artificially raise the humidity for clones. Clones seem to root and grow the fastest when the temperature is slightly warm, about 70-85°F (20-30°C), just like a cannabis plant in the vegetative stage. Young seedlings tend to grow faster with relatively high humidity and warmer temps, but as the plant gets older, it flourishes even if temps and humidity drop a bit. 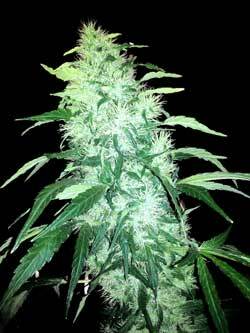 A cannabis plant’s ability to withstand drier and colder conditions tends to increase as the plant gets older. Outdoor-grown plants tend to be much tougher about temperature fluctuations than indoor plants. It's good to aim for a temperature of 70-85°F (20-30°C), during the vegetative stage while trying to give plants slightly cooler temps during the dark period than during the light period. Slightly cooler night temps (that stay within the specified range) tend to promote the fastest and healthiest vegetative growing for cannabis plants. Unless you are supplementing with CO2, you should strive to keep temps under 80°F (26°C) throughout the flowering stage! This is one of the most important things you must do as far as temperature during your grow, as keeping temps low during the flowering stage will help your plants produce the most potent, trichome-covered buds possible. That's because higher temperatures during the flowering stage not only can cause plant problems and slowed bud growth, it can also cause terpenes to evaporate into the air. What that means is if your buds stay too hot during the flowering stage, the higher temperature may accidentally be burning away some of your terpenes (reducing the final taste/smell of your buds after harvest). It is especially important to make sure buds are not exposed to too-hot temps after week 6 or 7 of flowering, as this is when the terpene content in the buds really starts to ramp up. There's some evidence that you can increase the terpene content and trichome production of your buds by giving your cannabis plants slightly cooler temps indoors when the lights are off. This has to do with how the change in temperature affects plant processes. Note: Slightly chilly is okay, but never let your plants be exposed to freezing temps! Bonus! In addition to improving taste and smell, terpenes can affect the color of plants and cannabis buds. For example, terpenoids are what give tomatoes their red color. This may be at work for certain cannabis strains, too. By maintaining lower night temperatures in the last few weeks before your cannabis harvest, you will help bring out colors in your cannabis (purple, pink, blue, etc). 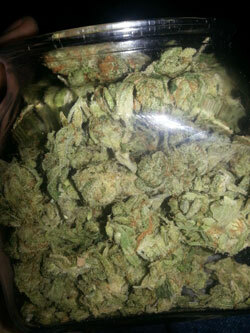 Of course this only works if your strain has the genes to produce colored cannabis buds. Most strains will only grow green buds, but if your plant can produce other colors, cooler night temps is one way to bring them out! While starting with good genetics and growing your plants properly are key to growing top-self quality buds, your job isn't over when you cut down your plants at harvest. In fact, I'd say that almost 50% of the final bud quality is determined after you cut down your plants, but how you choose to dry & cure your buds. Buds that have been professionally dried and cured are more potent, smoother to smoke, look better, and have that coveted "sticky-icky" feeling. The main thing you must do as a grower to professionally dry and cure your buds is maintain the proper temperature and humidity during the process. If you follow the right method, you never have to worry about mold or overdrying, and you will get perfectly cured buds every time. Many cannabis growers worry about how their indoor grow lights will affect the temperature of their grow room. This is a valid concern, and this section will break everything down for you. CFL grow lights can be purchased from the grocery store, and can be kept mere inches from your plants so they are great for growing in very short/tight spaces where ultimate stealth is the biggest goal. CFL grow lights have earned a reputation for being very low heat. And it’s true that you can successfully grow a cannabis plant under just a few CFLs, and they won’t give off much heat. However, if you want to get bigger yields, you’ll have to keep adding more and more CFLs, and the heat they give off will start building up. I generally don’t recommend growing more than 1 or 2 cannabis plants at a time under CFLs – if you want to grow more plants than that, I highly recommend upgrading to a small HPS grow light instead. 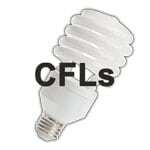 Other fluorescent lighting uses very similar technology as CFLs, but the bulbs come in different shapes, some of which can be more suitable for growing. 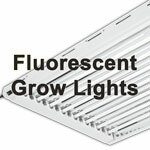 While not as stealthy or small as CFLs, other fluorescent lighting can be a cheap and simply way to grow young cannabis plants, and is used by gardeners around the world. 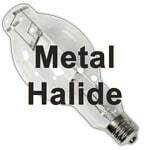 MH/HPS grow lights are known for using a lot of electricity and producing a lot of heat. And while that’s true for the bigger models of HID lights, I think a lot of growers overestimate how much heat will be produced by the smaller HID models. For example, a lot of people recommend that new growers get CFLs instead of HIDs so that there's less heat in the grow room. Yet it's important to keep in mind that 250W of HPS light will produce about the same amount of heat as 250W of CFLs, except that you’ll get more light and better yields with HIDs. Another advantage of HIDs over smaller lights like CFLs is good models of HIDs come pre-built to accommodate cooling via an exhaust system. This generally makes it easier to cool an equivalent amount of HIDs compared to CFLs. However, HIDs do need more height than growing with CFLs, so if height is limited, than HIDs may not be a good choice for you. But, if you do have the height to accommodate an MH/HPS light, I highly recommend going for that over CFL grow lights. In my opinion, CFL grow lights should only be used in very short/tight spaces where ultimate stealth is the biggest goal. 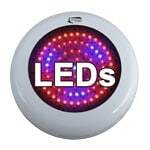 LEDs are known for needing just a little electricity and for producing less heat than HID grow lights like MH or HPS lights. But is all the marketing hype true? It's actually a lot more complicated than just a "yes" or "no" answer. The truth is, some LED grow lights work incredible, and some are a ripoff. It's important to educate yourself about LED grow lights in order to make sure you get exactly what you're looking for. While it's important to measure the temperature, it's also important to know what the relative humidity (RH) of your grow room is. So it is recommended that you get a tool that will allow you to measure both temperature and humidity at the same time. But it's not necessarily that easy, it can be tough on the quest to find the perfect thermometer/humidity monitor. While you can find cheap ones at the local store, you may notice that a lot of the cheaper models are a few degrees "off". This is probably not going to have a huge effect on your grow room though. Some growers will buy 2 or 3 different ones and look at the average to determine what's really going on in the grow room. I have several that I've picked up over the years, and they all sit in my grow room now. This is the temperature and humidity monitor that I use primarily in my grow room. It's made for incubating chicken eggs, but works great in the grow room. This thermometer and humidity monitor is accurate (at least when compared to the others I have in the grow room). It can be tough on the quest to find the perfect thermometer/humidity monitor, especially if you don't want to spend a pretty penny. From the grower: "I'm a gadget freak on the search for the best humidity & temperature monitor. I found this one and it seems to be very accurate compared to all the others. Does a little more than what I need but I need the accuracy part. According to everything I have read it really seems to be the most accurate at an affordable price, and the best reviews! !﻿"
If your temperature is too high or low…. 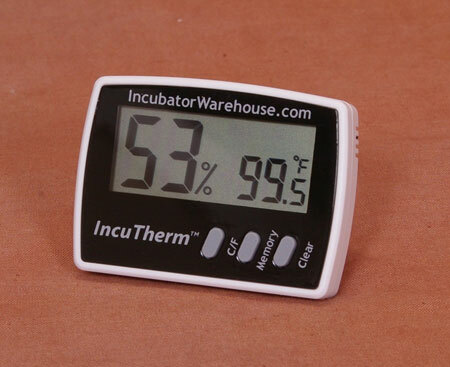 There are many tools available to help you control the temperature of your grow room. Both hot and cold in your grow room? For those who struggle with both hot and cold temps where you live, you may want to consider getting an All-in-One Heater & Air conditoner. Air Circulation: If there is a lack of good air circulation in the grow room, you will tend to get hot spots that can damage your plants. 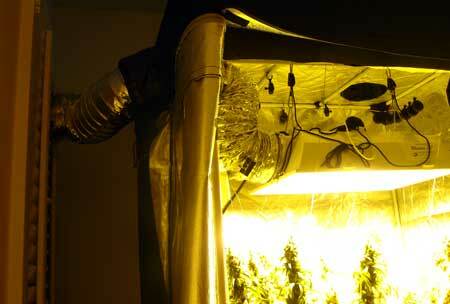 It’s always a great idea to install fans in the grow room to help circulate the air inside the tent. Remember – don’t point fans directly at plants; leaves can be rustling slightly but stems should not be waving around due to the direct breeze of the fan. I like to point fans slightly over or under the canopy so it’s not directly pointed at plants, or sometimes I will point the fan directly at a wall near the plants so it causes the air to move without moving the plants around too much. Change the Light Schedule: If you’re in a situation where the temperature is climbing too high at certain parts of the day, then you can change your light schedule so that your grow lights are off during the hottest part of the day. For example, in the vegetative stage your plants needs 18+ hours of light each day. If it gets too hot in the middle of the day, you could set your timer to turn your lights off for 6 hours during that part of the day. This strategy will not fix a major heat problem, but can help alleviate symptoms of heat stress during a short hot spell or heat wave. Consider Getting Different or Smaller Grow Lights: Learn more about how grow lights affect your temperature earlier in this article here. Other Ways to Cool: If you have good air exchange and have tried all the steps above, but the temperature in the grow area is still too hot, you will need to use a proven way to cool your grow area. 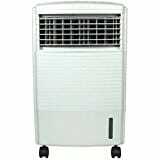 Air Conditioner – (some are portable, some ACs fit in your window) – in addition to cooling the air, an AC will also tend to lower the relative humidity of the air. To be effective, and AC must be able to exhaust hot air outside the house, just like hot grow lights. 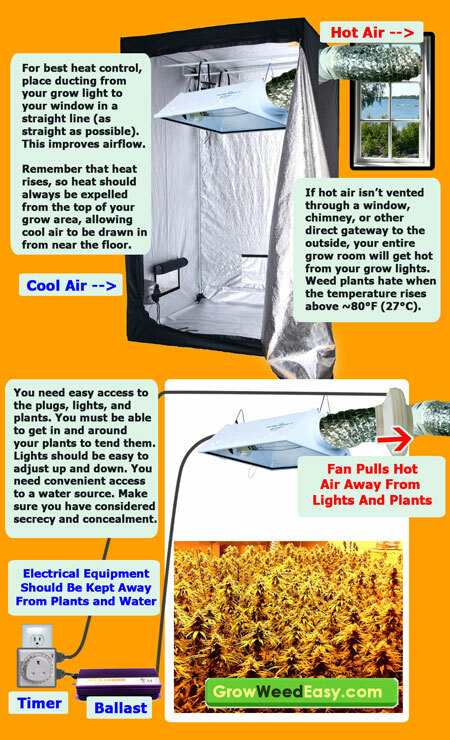 If the air outside the grow tent is already too warm, you will need to get an AC to pre-cool the air before it enters the grow tent. No matter how strong your exhaust system, it won’t be able to bring the temperature lower than your ambient room temperature. If you need to lower the ambient room temperature, you're going to need a way to cool the air, and air conditioners are hands-down the most effective way to cool your air. Swamp cooler – (also known as an "evaporative cooler") Ideal for those where it’s both hot & dry as the swamp cooler will bring down temps while also adding additional humidity to the air. Works best when humidity is too low and temperature is too high. Read how one user used a swamp cooler to control his temps & humidity. Did you know? Cannabis plants like higher temps when you supplement the grow room with CO2, but there are a few important things you must know about CO2. You must seal the environment, provide a lot of light and keep temperatures between 85°F (30°C) and 95°F (35°C) for CO2 enrichment to be effective. If it’s too cold in your grow room, sometimes you have additional options besides just getting a heater, such as getting a stronger/hotter grow light, or using additional insulation to contain the heat of the grow lights you do have. If your plant is not insulated from the cold (for example if it's growing in the middle of your garage, basement, attic, etc), then the first step is to make sure your plant is properly insulated. It's cheaper and easier to insulate a small space, so it's important that you create a dedicated grow box or get a grow tent that will act as the outward bounds of your grow area. 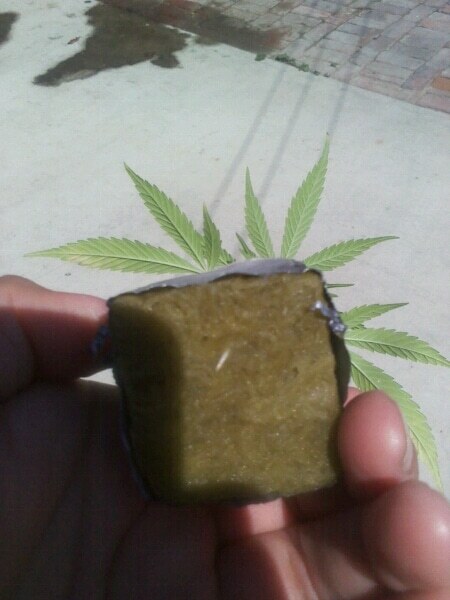 Then you can buy rolls of insulating materials for cheap at your local home improvement store, and use these to insulate the outside of your grow area. This will help keep the cold air out, and the hot air inside. With a properly insulated grow box, your grow lights will likely provide enough heat to keep you cannabis plants warm unless you live in a freezing cold area, or perhaps if you're in the middle of winter or a cold spell. If you must get a heater to keep your plants warm, avoid letting it blow hot air directly on your plants, and especially avoid ever having it in the tent with your plants. You want a heater that radiates heat out evenly, instead of pushing out a blast of hot air like a space heater. Never allow hot air to blow directly on any part of the plant. Most heaters can be set to turn on and off depending on the temperature, so they're only turning on when needed. The following model of heater is a great example of the type of heater you want for your grow room – it puts out gentle heat and has a thermostat you can use to have it automatically turn on and off as needed. The heat radiates out instead of being pushed out (which you don't really want in your grow room). It's almost completely silent. Plus it comes with a timer, so you can have it preset to turn on just before lights go off for the night (or whatever you need for your space).